For many undergrad accounting students, working for a big 4 firm is the pinnacle of jobs out of college. Big 4 jobs are often competitive because of the tremendous opportunities these jobs present. 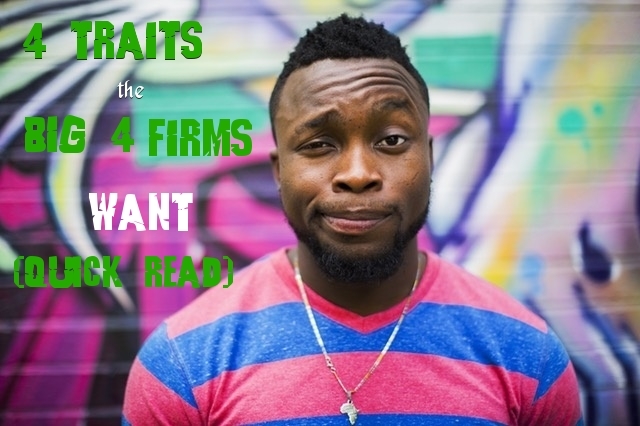 Below are 4 traits all the big 4 firms want. Coachability: This is one of the most important traits the big 4 want to see in a candidate. The firms don’t expect you to know what you are doing on your first day, but they do want to know whether they are able to help train you to do your job. Will you respond well to constructive criticism? Analytical Thinker: If you are not a problem solver, accounting is not for you. Can you take a bigger problem and break it down into manageable pieces so that it is solvable? The big 4 firms want to know that you are capable of making smart, fast, and effective decisions. Reliable: Do you get work done within timelines that are set? You need to be able to complete your work with a high level accuracy with in timelines while in the public practice. Governments don’t extend tax deadlines because of procrastination. Team members working on different parts of the audit can’t be held up because of your missed deadline. Multi-tasker: During your time with a big 4 firm you will have multiple engagements going on at once. It is important have the discipline to devout the proper amount of time and resources to each engagement. Your ability to handle each one effectively will display that you have the competency to take on bigger responsibilities. Bigger responsibilities equal bigger promotions. Take the time to incorporate these 4 traits into your resume and LinkedIn profile while applying for big 4 opportunities. I would also recommend preparing interview answers where you can show times where you have displayed these traits.